It’s rare that a film can both homage and satirize a genre effectively - The Cabin in the Woods does both quite well. It's tough to discuss TCITW without spoilers, some of which are given away in the film's marking campaign. So, spoilers ahead for those who haven't seen the film and want to be completely surprised. [Spoiler Warning] The Cabin in the Woods uses a well worn horror premise. 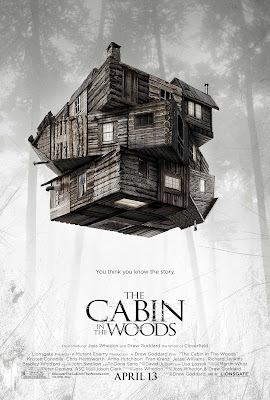 Like all of the films in its subgenre, a group of high school or college age kids go into a "cabin in the woods" and get terrorized by various supernatural baddies. Films like The Evil Dead and Cabin Fever come immediately to mind as examples. But unlike films that play the premise straight, The Cabin in the Woods has other tricks up its sleeve, doing for "wilderness horror" what Scream did for slashers over a decade ago. Here Kristen Connolly (The Bay), Chris Hemsworth (Thor), Anna Hutchinson, Fran Kranz (The Village), and Jesse Williams (Brooklyn's Finest) play five kids who head to the - cabin in the woods - for a vacation. They quickly mimic the familiar beats of this subgenre, making choices that will directly put themselves in danger. The twist, as hinted at by the advertising campaign, is that the cast is being controlled by a group of TV People at a remote location (Richard Jenkins, Bradley Whitford). By using pheromones, whispering suggestions and other subliminal nudges, the five campers unleash undead, hillbilly pain worshipers sure to be their demise. The kids slowly realize they're being coerced into their actions, and set out to survive the ordeal. From their control room, which is visually a cross between a TV station and NASA HQ, the TV People make the twentysomethings behave in stereotypical horror fashion because it's what their "audience" wants. There is a constant push and pull between what the characters want and what the TV People and their "audience" (ostensibly those sitting in the theater) want. The filmmakers know that the audience knows how predictable horror films can be and the main cast practically begs to be allowed to do something "different." It's unfortunate the film doesn't really stick it to, well, any any number of satirical targets in the third act. Despite having this of disdain for shoddy horror films, The Cabin in the Woods also has a clear affection for monster movie mythology. Toward the beginning of the film, a joke is make of the TV staff betting on how the five kids will die. By the end of the film, many film baddies are homaged including Pinhead, The Grady Girls, and, of course, Zombies. [End Spoilers] If you’re a horror fan, don’t wait to see The Cabin in the Woods. Though it’s definitely an R-rated film, it’s strong enough to give a recommendation to general audiences who can stomach the gore. It’s a lot of fun and one of my favorites from 2012 thus far. Had the filmmakers gone a little father with their satire, it could have been a masterpiece.